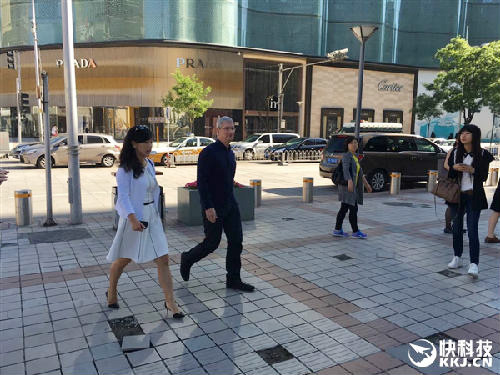 Apple CEO Tim Cook and the president of taxi/ridesharing service Didi Chuxing, Jean Liu, visited an Apple Store in Beijing on Monday morning, just days after Apple's confirmation of a $1 billion investment into Didi. The main purpose of Cook's visit to Beijing was for an App Store "developer activity," reported the state-controlled China Daily. The heads of several app-related firms were said to be at the gathering, and Cook later told the Daily that Chinese app developers have so far reaped over $7 billion, half of that in the last 12 months. On the Didi Chuxing deal, Cook reportedly said that Apple made its investment because Didi "has a very great management team," and "its objective is also environmental, hoping to help reduce pollutions [sic] by making more efficient use of cars." That could further fuel speculation that the deal is connected to Apple's electric car project, particularly if and when a self-driving model rolls off assembly lines. Apple could be hoping to sell vehicles into Didi's fleet, and ridesharing services in general are expected to make the shift to self-driving cars since they cut down on human labor costs. Previously Cook claimed that the Didi investment happened "for a number of strategic reasons," including "a chance to learn more about certain segments of the China market." The Daily added that it was unknown whether Cook would meet with any high-level government officials during his latest Chinese trip, as rumored. In April the government shut down the local iTunes Movies and iBooks Stores, something Cook would presumably work to reverse as soon as possible.